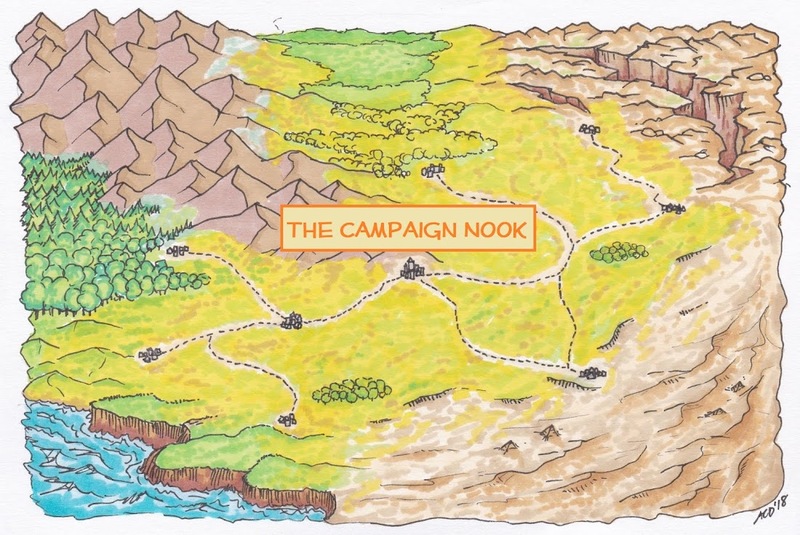 When I first picked up Kobold Press' Southlands campaign book, I was especially struck by the wonderful cartographic details throughout the maps created by Anna Meyer ( Fantasy Maps by Anna B Meyer ) of Greyhawk maps' fame. As I worked on my Narumbeki Gap setting, I strove to pull details out of the large maps and incorporate them into the posts. 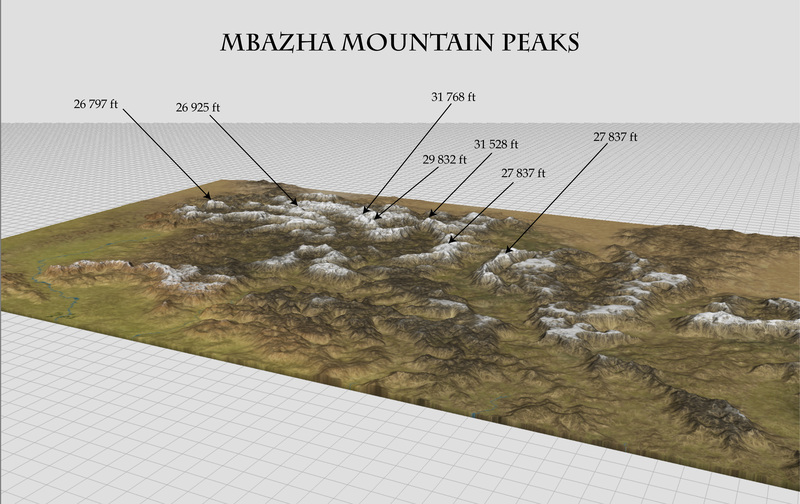 To that end, I sent Ms. Meyer a message on Facebook ( Greyhawk Maps by Anna ) asking what the highest elevations were present in the MBazha and Fassili ranges. She responded by sending me two wonderful closeups, from her 3D Southlands continent map, of both ranges with the highest points marked therein. Wonderful stuff! Now, even better, the folk over at Kobold Press have turned those maps into an article - More Locales of the Southlands - complete with both images and additional material regarding some of the unique aspects of each range. 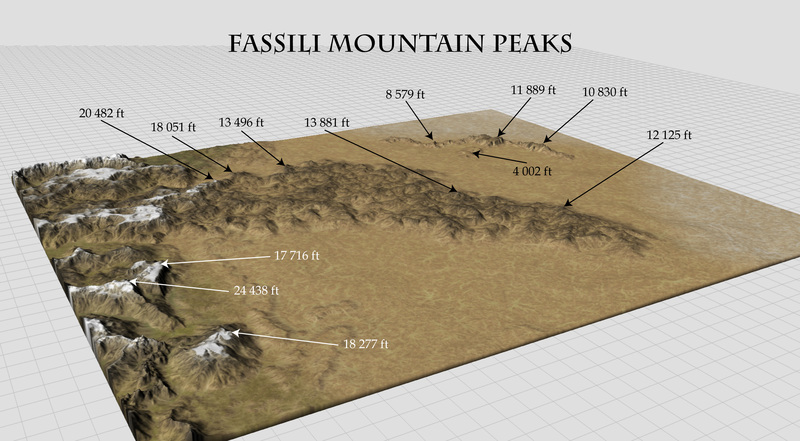 A terrific article which, mildly unfortunately, will lead to a delay in my chapter on the Southern Fassili mountain range, as Ben and Brian had an entirely different atmosphere in mind for those peaks. Back to the drawing board as it were, but in a good way. Aye, there may still be a Jinn anchored to the range, but now perhaps it was as a result of a terrible conflict that left the haunted ruins in the valleys and passes. Living jinnborn continue their path around the range, but now perhaps to keep things from leaving instead of keeping outsiders from entering.